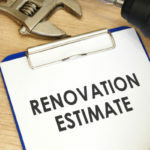 How do you save money while completing a kitchen remodel? That’s the million-dollar question homeowners are continually faced with. A surface remodel grants you the opportunity to make changes that improve the overall appearance of your kitchen without costing an arm and a leg. 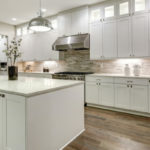 Basically, a surface remodel includes a number of cosmetic refinishing options such as, refacing cabinets or painting the kitchen walls a different color. In many cases, surface kitchen remodeling projects are DIY-approved, meaning you can upgrade your kitchen for a far more affordable price. A surface remodel on your kitchen will save you money on designer fees, building permits, and materials. Plus, you won’t have to install new plumbing or tear down any walls. Here we detail 7 ideas and tips for surface remodeling to upgrade your kitchen on any budget. A dark kitchen can feel a bit dated and depressing, but adding a new window is a costly renovation that might currently be out of the budget. Instead of cutting through you kitchen walls, you can simply repaint the kitchen a brighter and lighter shade of paint than the current coat. Paint color alone can have a huge impact on the look and feel of a space, and it costs much less than cutting into the wall. Another way to brighten up a kitchen is to add new lighting fixtures. New lights will also add new style to your kitchen. Recessed lighting typically requires professional installation, while surface-mounted lighting fixtures are more affordable and easy to install, making them a great DIY kitchen remodel tool. 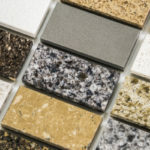 Tiles, bricks, or paint, there are so many materials you can use to adorn the backsplash in your kitchen. Changing the color, texture and appearance of this accent wall has a profound impact on the overall design of your kitchen. In many cases you can do it yourself, just conduct some simple online research, get creative, and have some fun! A huge kitchen remodel often includes moving around appliances, and changing the original layout of a kitchen. In many cases, this is actually unnecessary and the organic footprint of your kitchen can be left as is while still securing excellent results. Changing the original layout of the kitchen is the fastest way to tally up costs as well. As soon as you start moving appliances there are new expenses to consider, such as plumbing and electrician work. If you plan to rewire your kitchen, you can expect associated costs to total around 25% of the overall budget. 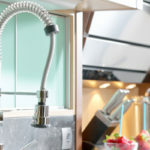 Unless your number one issue with your kitchen is the layout, it’s always more affordable to keep the sink, fridge, oven, and walls where they currently reside. If your cabinets are still in overall good shape, and don’t have any mold or water damage, you can reface your cabinets for a fraction of the cost to replace. Refacing cabinets includes removing the doors from the frame, cleaning the wood, buffing it out, and re-painting it a different color. You can make light cabinets dark, or dark cabinets light, cabinet refacing offers you a world of new options. You can also take this time to switch out old hardware handles for new ones. A great looking set of cabinet doorknobs can add a lot of style, making cabinetry look like new. If your cabinets are fairly aged, riddled with issues related to mold or water damage, it might not be the best idea to reface cabinets. Thankfully, there are endless options for stock kitchen cabinets, which are far more affordable than custom cabinets since they are stocked in bulk. A general contractor or handyman can affordably install stock kitchen cabinets, giving you brand new cabinets without spending as much money as you might assume. Depending on where you live, different projects require different permits before they can be conducted. 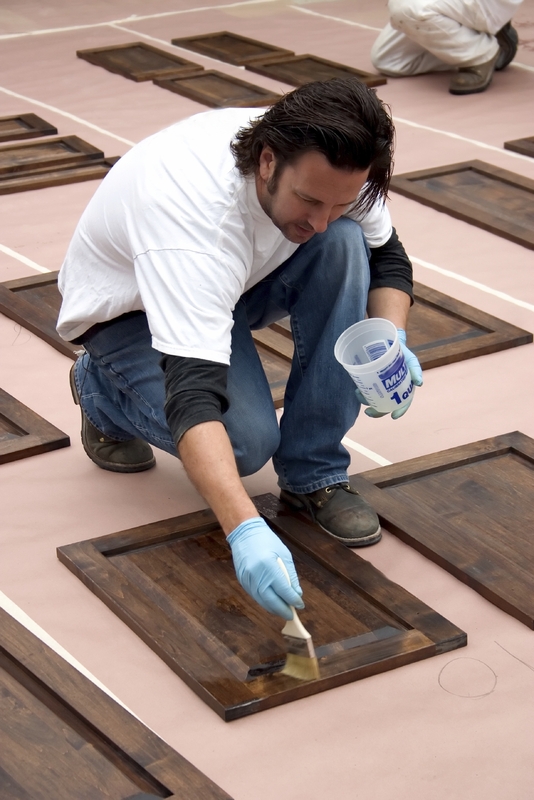 Acquiring permits takes time and money and can be completely avoided with a surface remodel. Instead of pretending you don’t need a permit when you do, skip out on the projects that require permitting wherever possible. Plumbing, electrician work, and moving walls all require permits, as well as expandable budgets. Additional counter space can change the functionality of a kitchen, making it look better and perform better. More counter top space can be added in a few ways without adding a costly center island or rebuilding your entire kitchen. You can increase your countertop space by installing a pull out cutting board between your countertop surface and the top drawer. There are custom made options available, but in order to keep true to your budget you can purchase stock models as well. Another great way to add additional counter space is to invest in an affordable rolling island cart. These awesome accessories are very affordable, many offered for under $100. Since there are a number of different sizes available you can pick the dimensions best suited to your kitchen. Not only does a rolling kitchen island cart offer you more space to cook on, but it also offers you extra storage space below. When redoing your kitchen from top to bottom there are a number of things that tend to take up a large portion of the budget. By conducting projects considered as a surface remodel you are able to skip out on the most expensive aspects of a full kitchen remodel. Plumbing, electrical work, and custom made cabinetry all get very expensive, and in many cases are unnecessary. Often, all it takes is refacing cabinets and applying a fresh coat of paint to score a new and improved kitchen. Allow the pros at Tops Kitchen Cabinet help you achieve a beautiful new kitchen on any budget. We offer a wide selection of kitchen cabinets, countertops, and more, all at wholesale prices you can afford.